German Shepherds are one of the most popular breeds of dogs in the United States. They are friendly, strong, protective, and loyal. German shepherds are big dogs. They generally grow to be around two feet wide, if measuring from the shoulder blade, and they weigh somewhere between 50 and 90 pounds. They have large pointy ears, which usually stand up straight. Their fur color is mostly tan and black, or reddish and black. They have a double coat of fur which keeps them warm. 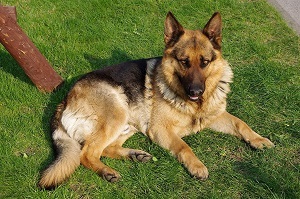 German Shepherds usually live around 10 years, which is common for dogs their size. One health issue that they face is elbow and hip problems later on in life. Sometimes, they get ear infections too. German Shepherds can act as good guards which is why today they are commonly used as police or military dogs. They also have a strong sense of smell, and can be trained to sniff out drugs, bombs, and people’s scents, for search and rescue missions. German Shepherds need a lot of exercise and activity. They are very active dogs and like to please their owners. They are not the most friendly dogs to strangers and can act disinterested until they get to know you. If they are not properly trained, they can end up being a little too overprotective of their family. Depending on how owners train their dogs, their protective instinct can be honed or diminished. If owners don’t show their dogs that they are the leader in the relationship, the dog will recognize their owner’s timidity and take over. The dog will tell their owner where they can and can’t sit, and what they can and can’t touch by growling, pushing, or even biting. German Shepherds are one of the most popular dogs in America, mostly because they are protective and loyal to their owners and also are intelligent and obedient.